Congratulations to Ian Wilson and Nicolay Sidorenkov on the publication of this important paper. The tight synchronicities certainly indicate a planetary-Luni-Solar linkage. The movements of the stars in the sky causes changes in weather and climate…..
Huh……………………………. 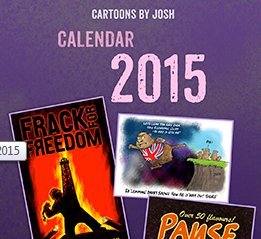 maybe there is something to Astrology and the Farmers Almanac. Human observation over thousands of years must have some basis in fact. This paper by Wilson and Sidorenkov represents an excellent work on atmospheric and oceanic tides, caused by sun and moon since the time of immemoria. Those who prevent to control ‘climate’ statistics, by e.g. teaching herbivores (and other, man-made engines) not to fart, they achieve nothing but industrially caused energy poverty and industrially caused famines. It is high time to dismember self-aggrandised UN and EU, to overturn their warfare through displacement, migration and hatred. Make the good policy of the Donald prevail. Thank you Tallbloke and oldbrew for highlighting our paper. The linkage between planetary motions and solar activity has long been nurtured and developed by those here at Tallbloke’s Workshop. Both of you have played a critical role in developing these ideas and your important contributions need to be acknowledged at this time. This paper by Nikolay Sidorenkov and myself further extends this important work to show that there is also a linkage between planetary motions and shape and wobble (i.e. the precessions – LAC and LNC) of the lunar orbit. It is the first of a series of three papers that will show that much of the variation in the world mean temperatures on decadal to centennial time scales is being driven by the Moon’s influence upon the El Nino/La Nina (i.e. ENSO) cycle. The Cenomanian-Turonian Eagle Ford Fm consists of a succession of calcite-rich mudstones (marls and limestones) and over 300 volcanic bentonite layers. Astronomical analyses on >150 m intervals have demonstrated that the limestone and marl cycles reflect climatic forcing driven by solar insolation resulting from integrated Milankovitch periodicities. In particular, periodic solar-terrestrial orbital variations including obliquity (37-50ka) and precessional (19-23ka) forcing on summer insolation and its impact on seasonality may have been responsible for the observed lithologic and environmental variations. Furthermore, preliminary analyses of three 0.3-0.5 m thick precession cycles (limestone-marl couplets) have identified periodicities in similar range to the DeVries (200 years) and Gleissberg (83 years) solar cycles, with 99% F-test significance and passing red noise test. These millimeter-scale laminations therefore may reflect century-scale depositional processes. The exact nature of these century-scale variations in solar forcing on individual lamina is uncertain. To better understand the depositional effects of solar and possible volcanic forcing on these sediments, numerous high resolution analyses on a “continuous” 35 cm long thin section from the same precession cycle as the astronomic analyses have been undertaken. These analyses include millimeter-scale sedimentologic descriptions, micropalaeontologic assemblage reconstructions for individual lamina, combined with high resolution (250µm) X-Ray fluorescence (XRF) and total organic carbon (TOC) measurements. This research may contribute to a better understand of the role and impact of natural climate forcing mechanisms in greenhouse paleoclimates, and improve confidence in present-day simulations and future projections of solar and volcanic influence on century-scale change in the anthropogenically-driven climate of future centuries. Please be aware that they are more than 50 typos and mistakes in the pdf file that is posted at the Journal of Earth Science and Climate Change website. I am trying to get these misprints fixed but it is like pulling teeth from a Hippo. In addition, the paper’s appendix has been left out because of the editorial policies of this Journal. Ian, thank you for the acknowledgement. From our perspective we are immensely gratified that the fruits of our amateur investigations have been further developed and published by qualified scientists such as yourself. Your excellent contributions have turned the talkshop into a workshop which produces the goods. This is another example to demonstrate that the science is not “settled”. Why would the earth’s moon have any effect on solar activity? This work supports the idea that the planetary system is evolving into a state of resonance that is causing apparently unrelated phenomena to synchronize. My simplified engineer’s take is that we are seeing maximal entropy production at work. Synchronisation via resonance is actually a negentropic factor, because it prevents the solar system flying apart and its planets suffering cold deaths. You’ve misunderstood Ian’s paper. He’s not saying the moon affects solar activity, he’s saying the cyclicities of the lunar orbit and the cyclicities of solar variation are synchronised because underlying both are the cyclicities of the planets. It happens. Feel free to expand on it so I can understand the points you are trying to make. If I understand you correctly, pochas94, you are in fact agreeing with our conclusions. You appear to agree that the long-term maximal entropy state for the planets is current near-resonance that is observed. You also appear to agree with our contention that both the lunar resonances and the long- term cycles in the level of solar activity are a response to those resonances. What our work implies is that the solar activity variations and/or the lunar tidal variations must play a role in determining the variations in the long-term World mean temperature, as well. See Ian Wilson above. Please note that tidal friction generates entropy and yes, that causes orbits to recede, as for example the moon receding from the earth. This will not cause the solar system to fly apart, because the more the orbits recede, the less tidal forces and the less tidal friction. When the solar cycle is at low ebb, he says, there is a reduction in its outgoing “winds” of charged particles—which act as a shield to deflect incoming cosmic rays. This reduction allows more cosmic rays to enter our solar system, and our star itself. So an uptick in cosmic rays should lead to an uptick in gamma rays…. the sun’s total gamma-ray emission is most intense along its equator at solar minimum and at its poles during maximum. Worth noting that Charles D Keeling (of Mauna Loa Co2 measurement fame) and Timothy Whorf were also proposing a lunar tidal theory of Centennial and Millennial climate change back in 2000. They homed in on the Jose cycle rather than the De Vries as the Centennial period. I think Ian is getting us further forward with his work though. Variations in solar irradiance are widely believed to explain climatic change on 20,000- to 100,000-year time-scales in accordance with the Milankovitch theory of the ice ages, but there is no conclusive evidence that variable irradiance can be the cause of abrupt fluctuations in climate on time-scales as short as 1,000 years. We propose that such abrupt millennial changes, seen in ice and sedimentary core records, were produced in part by well characterized, almost periodic variations in the strength of the global oceanic tide-raising forces caused by resonances in the periodic motions of the earth and moon. A well defined 1,800-year tidal cycle is associated with gradually shifting lunar declination from one episode of maximum tidal forcing on the centennial time-scale to the next. 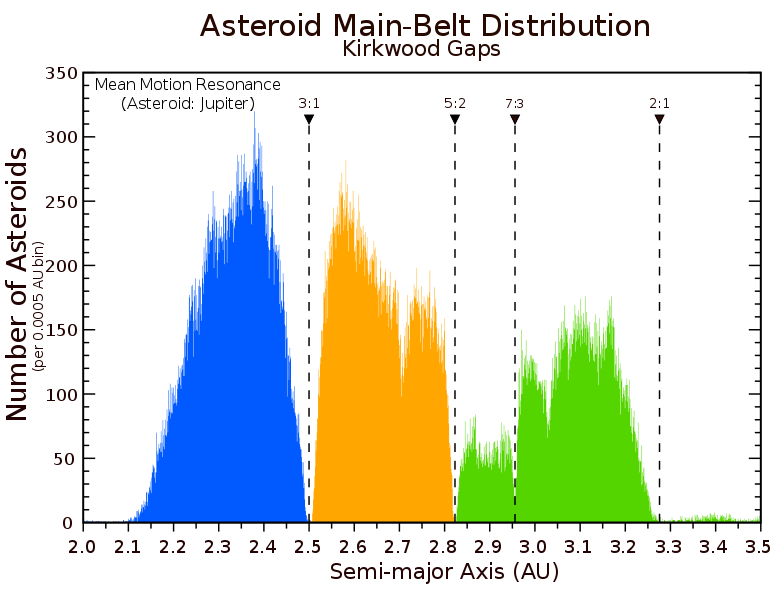 An amplitude modulation of this cycle occurs with an average period of about 5,000 years, associated with gradually shifting separation-intervals between perihelion and syzygy at maxima of the 1,800-year cycle. We propose that strong tidal forcing causes cooling at the sea surface by increasing vertical mixing in the oceans. On the millennial time-scale, this tidal hypothesis is supported by findings, from sedimentary records of ice-rafting debris, that ocean waters cooled close to the times predicted for strong tidal forcing. A cause for such greater regularity in tidal forcing might be resonances of other bodies of the solar system, especially the outer planets. We are struck by the close correspondence of the average period of the 180-year tidal cycle of 179.5 years (1/10 of that of the 1,800-year cycle) and the period of the sun’s rotation about the center of mass of the solar system of 179.2 years, the latter a manifestation of planetary resonances. The forces involved in tidal friction are tiny compared to those involved in planetary resonance. I think the recession of the Moon from the Earth will turn out to be a part of a cyclic back and forth forced by Venus and Jupiter (which, within an order of magnitude have the same gravitational pull on the Earth-Moon system), which totally overwhelms any recession forced by tidal interaction. 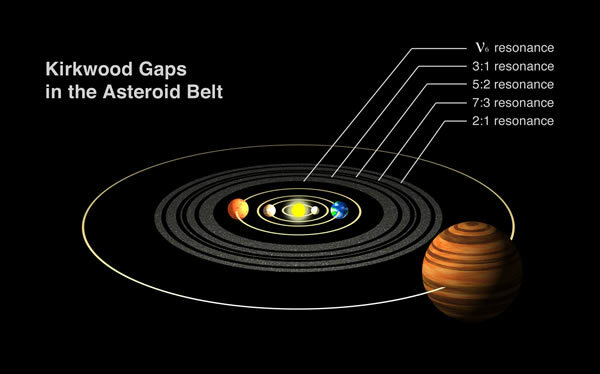 Some astrophysicists think that the outer planets may have been re-ordered in the deep past by strong resonances such as the 2:1 orbital resonance. Those are the kind of forces that would cause a planetary system to fly apart, if there wasn’t a re-synchronising effect occurring. You can see where some things have been forced to ‘fly apart’ (due to Jupiter effects) here. There is a direct connection between the orbits of the Earth and Moon and the length of the solar sunspot cycle. I think it was Paul Vaughan who first quoted the following relationship. TM = Tropical Month = the time between successive crossings of the Earth’s Equator by the Moon. Now, on average, Jupiter moves 13.0 degrees with respect to the periodic tidal bulges that are produced on the Sun's surface by the alignments of Venus and the Earth once every (1.5993 / 2) = 0,79965 (sidereal) years. This means that it takes 11.07 sidereal years for Jupiter to move through 90 degrees with respect to these tidal bulges. It the basic time associated with the tidal-torquing Venus-Earth-Jupiter model that I believe drives the solar sunspot cycle. 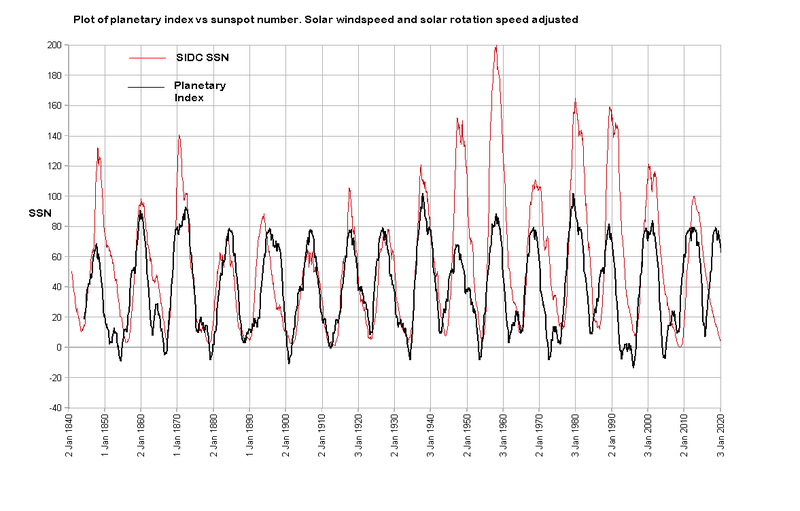 In my opinion, we’re entering a solar grand minimum, when the Sun may exhibit some pretty erratic behaviour, and all bets for precise solar cycle timings are off for the next 30 years. We’ll keep and eye on Ian’s prediction though. My take is that the current lull in solar activity (lots of spotless days so far this year), maybe followed by a weak resurgence which may well end within Ian’s predicted timeframe. A decade from now, we may see that weak resurgence as being somewhat similar to the ‘lost cycle’ that occured on the end of SC4 as the Sun entered the Dalton minimum. 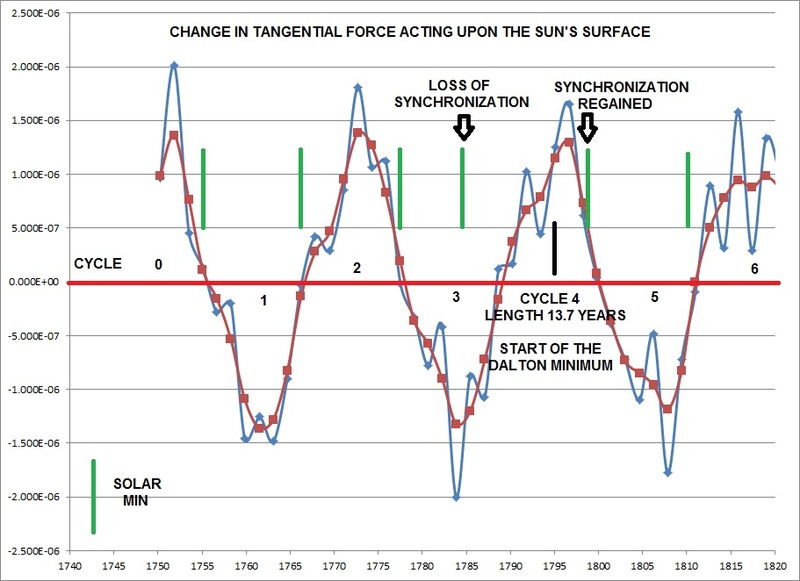 What I mentioned above about the timing of the solar cycle spans a period of time that covers the onset and termination of the Dalton and Maunder minimums. 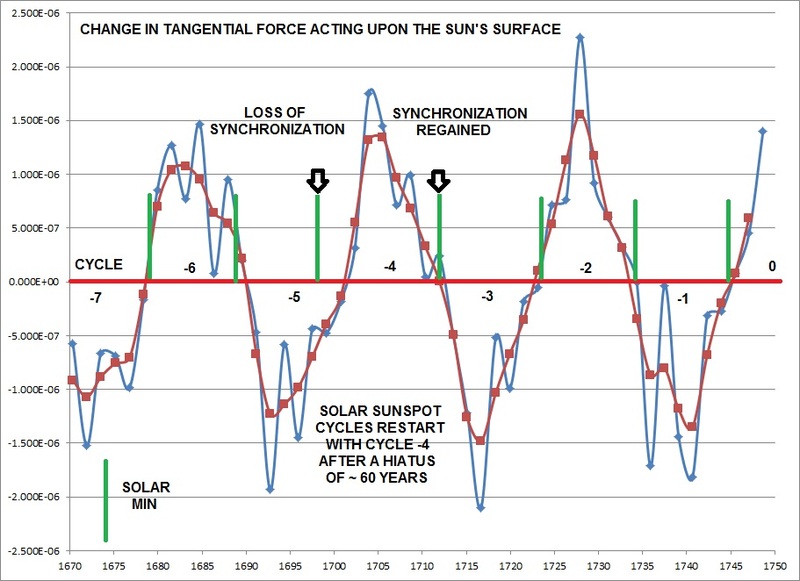 What appears to happen is a temporary loss of synchronization between the 11.07-year cycle and the timing of solar minimum that occurs sometime before the onset or start of the decrease in solar activity. The loss of synchronization only last for one (or possibly two) solar minimums. Yes, that’s evident in the VEJ study I did as well. Ignore the red line after 2010 in this plot, that was Ian Martin’s projection. The black line is VEJ adjusted for solar wind speed and my estimate of their electromagnetic contribution. You can clearly see the loss of synchronisation at the end of SC22 and 23, and the dip and resurgence around 2016-18. Bear in mind I did this plot back in 2010. But the serious loss of synchronisation with the ~11 year cycle makes me think this grand minimum could be much deeper than the Dalton and longer too. Unfortunately this model is on a long dead hard drive and corrupted backup, so I can’t resurrect and extend it. The above plot shows the loss of synchronization took place in the 1780’s and 1790’s. This is at the start of the Dalton Minimum with the extended cycle 4. 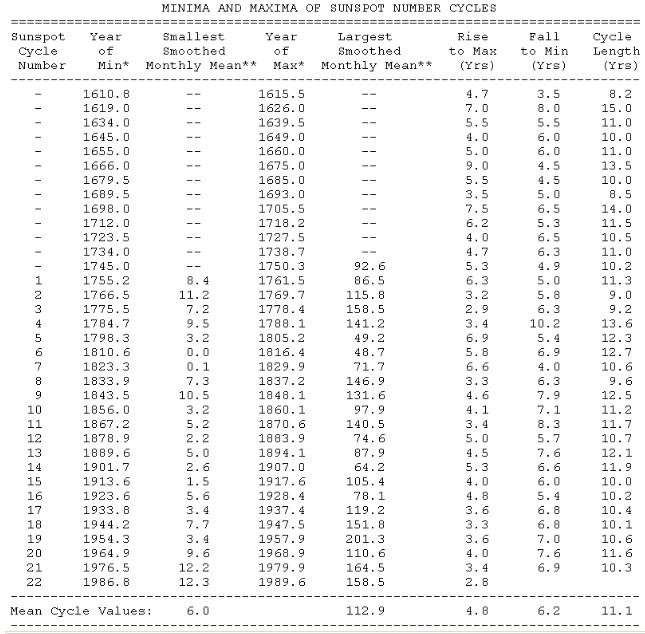 This shows the 80 year period covering solar cycles 6 through to 12 from 1810 to 1890. 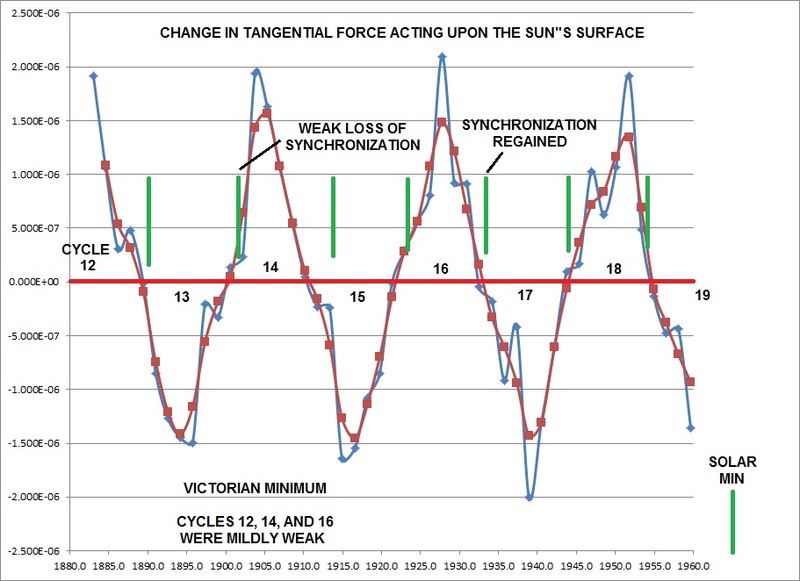 This shows the loss of synchronization around 1900 that produced the weakened cycle 14 and 16. This shows the loss of synchronization prior to the onset of cycles 22, 23.and 24. 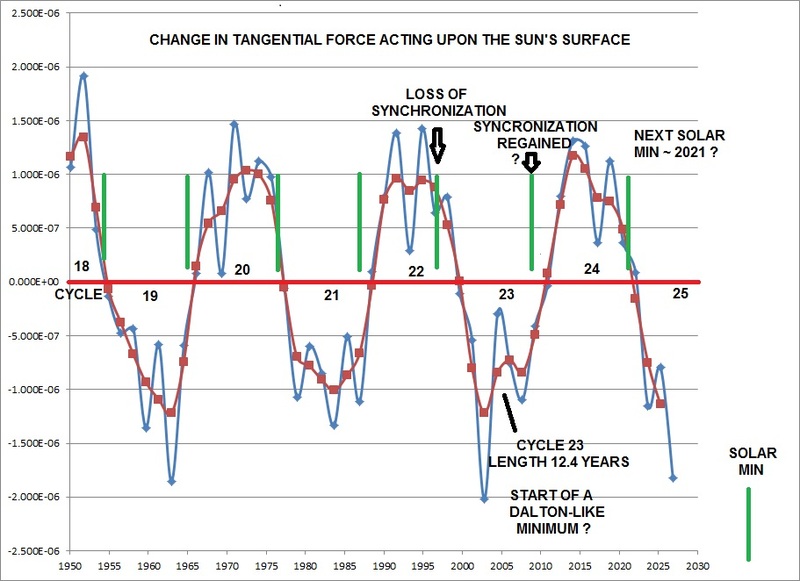 In other words, there have been 3 whole solar sunspot cycles with loss of synchronization. This might indicate that the upcoming minimum may be stronger than a Victorian or Dalton Minimum. 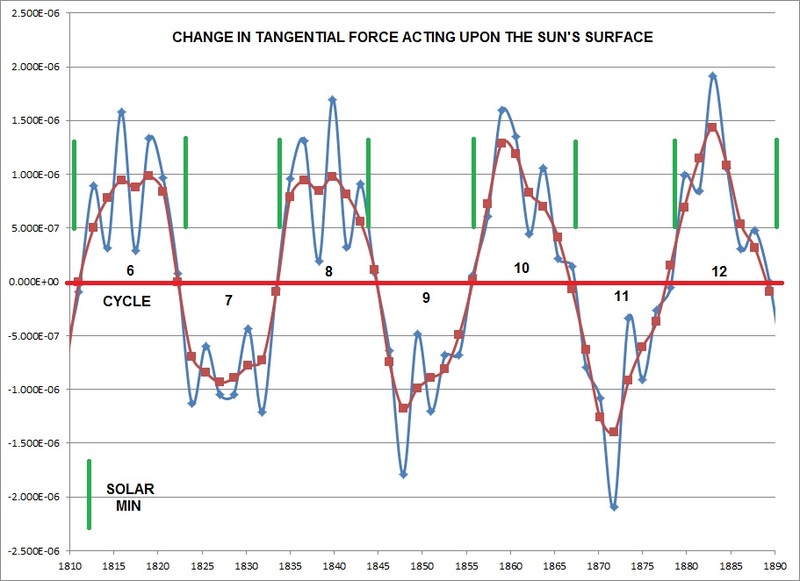 If the next solar minimum is at the end of 2020 to the start of 2021, it will mark the resynchronization of the solar minimums with the maximum change in Jupiters tangential force acting on the Earth-Venus tidal bulges on the Sun. There is a good argument that Maunder Minimum did not start in 1645 but actually started two whole solar cycles earlier during cycle -11. The plot above supports this with the loss of synchronization taking place around 1615 at the start of cycle -11. 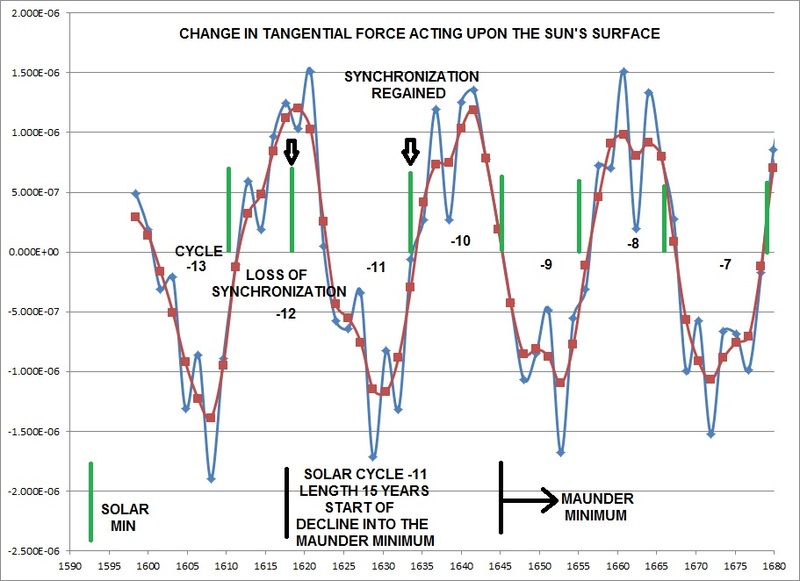 And as you can see from the above plot – it appears that end of the Maunder Minimum in 1700 is marked by a loss of synchronization just prior to cycle -4 (the first solar cycle marking the switch back on of normal solar activity). Serious scholarly work. Just eyeballing, but your blue torque curve seems to pick out single vs twin peak solar maxima quite well. It’s going to be very interesting to watch the evolution of solar activity for the rest of my days. The Jupiter-Sun line goes via the solar system barycenter around November 1615. The line has also been close to the SSB for over 5 years before that, which may possibly be unusual. The Sun passes through the SSB in 1632 (and again in 1811 and 1990 i.e. ~179 year intervals), with the 171.4 year U-N conjunction later, in 1650. The real question that needs to be answered is what constraints do the results of this paper have upon the influence of lunar tides on sub-centennial time scales. Nikolay and I address this important question in the second paper of the series. It shows that you can identify the actual lunar cycles that are operating on decadal to sub-decadal scales that are responsible for producing the long-term centennial lunar cycles. Not only that, you show that these processes are capable of describing most of the recent ]i.e. the instrumental record] variations that are seen in the world mean temperature on decadal to inter-decadal time scales (i.e. greater than ~ 7 years). Unfortunately, any discussion of the details of this second paper will have delayed until we can get it fully peer-reviewed. Looking forward to this. Sub centennial natural variation analysis has been way too woolly for way too long. 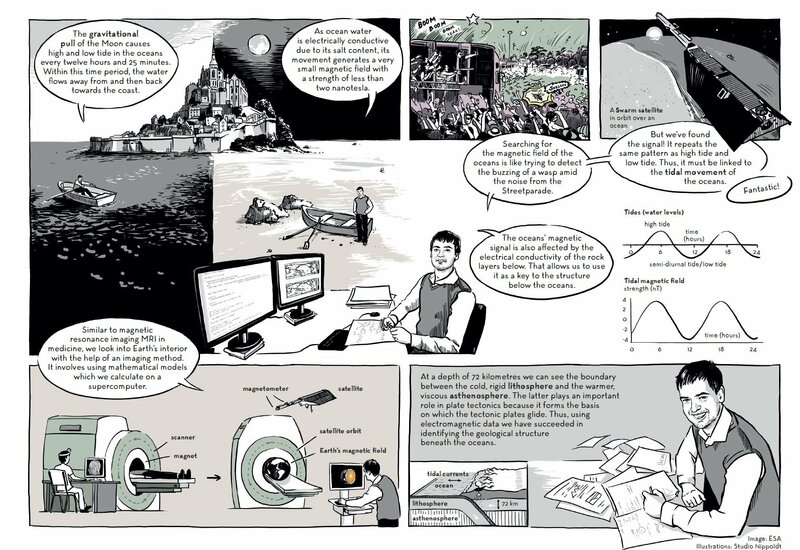 London, 6 April: A newly published paper in the journal Physica A suggests that there is an undiscovered universe all around us that we are too short-lived to perceive. I posted these comments at Judith’s site in response to her post. Most of what was posted comes from four blogs [astroclimateconnection.blogpost.com] posted in November 2014. Anyone can see these posts. I get on well with Judith Curry but I may have worn out the welcome mat with my somewhat prolific posts on her website. I have managed to get a link at WUWT back to this post at the Workshop – hopefully, this might direct a little traffic back over to the light-side of the “force”. The results obtained for various tree-ring chronologies indicate palaeoclimatic oscillations in the range of the de Vries (∼ 210-year) solar cycles through the last millennium. The quasi-200-year variations revealed in the palaeoclimatic reconstructions correlate well (R2 = 0.58–0.94) with solar activity variations (Δ14C variations). The quasi-200-year climatic variations have also been detected in climate-linked processes in Asia, Europe, North and South America, Australia, and the Arctic and Antarctica. The results obtained point to a pronounced influence of solar activity on global climatic processes. Thanks, oldbrew! – These are both very interesting papers. In our paper, we attribute it to being half the 208-year de Vries cycle. Now, we believe that it is more likely to be a spectral peak at 106 years. 186 – 18 = 168 etc. (28.75), (31.00), 59.75, 88.5, 148.25, 208.0-year lunar alignment pattern that is reported in our paper. Remember, this is the alignment pattern in a frame-of-reference that is fixed with respect to the Perihelion of the Earth’s orbit. 4 x 59.75 = 239.0 years. This is the 60-year climate cycle that is seen in the Earth’s trade-winds and other climate parameters. This is the European Space Agency’s spectacular new view of ocean tides as they sweep around the Earth. The movie [see link] shows not the bulging movement of water directly, but rather its magnetic signature. As the Moon pulls the salty seas through our planet’s global magnetic field, electric currents are generated. And these currents then induce their own magnetic signals, which have now been mapped in exquisite detail by a trio of Esa satellites known as Swarm. It is a remarkable achievement because the effect is actually very small. Other satellites will sense the tides as a change in sea-surface height. What is different about the Swarm trio’s magnetic view is that it reveals the movement of the entire water column, right down to the seabed. This is important for climate studies. The oceans store and transport vast amounts of heat energy, and getting the more integrated perspective from Swarm enables scientists to build better models of the Earth system. That’s a big problem as it didn’t turn notably colder until from 1672. The Sun was at the SS barycentre in 1632 and again in 1671. Your sunspot cycle max dates are way adrift.